Tim Baskett is a fully qualified furniture restorer who established his business in 1992. He studied for 4 years at the London College of Furniture, attaining an OND and HND in furniture studies bias area antique furniture restoration and conservation. He also attended John Makepeace's college in Dorset completing wood turning courses. Tim Baskett has a large private client base and works for several antique dealers in the Southend area. He uses traditional methods and materials and gives a high quality service to all customers. His aim is to offer a personal service of skilled craftsmanship and honest advice. With over 25 years of experience restoring furniture I offer a wide range of services specialising in antiques and all work is carried out by me to maintain a high standards. I can also arrange an upholstery service and clock movement repairs and servicing.I work with several local antique dealers and have a large private client base. I use traditional methods and materials and give a high quality service. To this end I store a selection of period timber and veneer in order to complete a sympathetic restoration and conservation service. 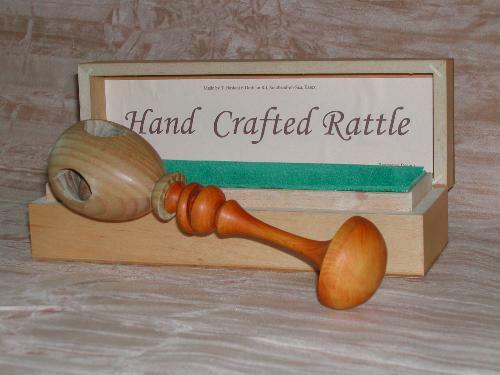 Tim also attended wood turning courses at John Makepeace’s college in Dorset and has designed a handcrafted baby’s rattle suitable as a gift to celebrate any new arrival.